The goal of Physical Processes and Laser Technologies Research Center of the Faculty of Engineering is to conduct research related to studies of physical and laser technologies, development of laser technologies and new products, involving students. RTA project “Research Grant of Rezekne Academy of Technologies” Research on Spectral Characteristic of Coloured and Marked Surfaces during Aging Process (project manager L.Lazovs, duration- 2017). RTA project “Research Grant of Rezekne Academy of Technologies” Development of Innovative Textiles by Integrating Laser Treatment Technologies (Laser Marking) (project manager L.Lazovs, duration- 2017). 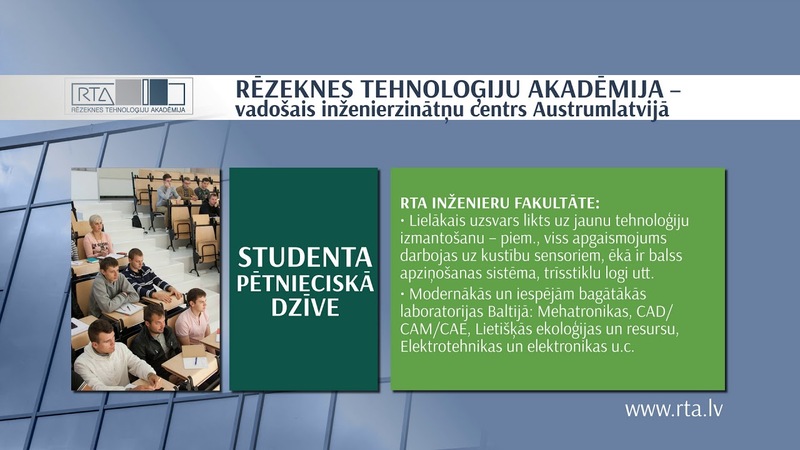 RTA project “Research Grant of Rezekne Academy of Technologies” Research on Laser Technologies for Colour Marking (project manager P.Narica, duration- 2016). Research based on client’s enquiries for specific laser use case, i.e., laser materials processing optimization. Colour laser marking on stainless steel – designing and marking of vector files suited for laser system. Laser cutting – high-quality cutting of acrylic glass, wood, fabric, and other materials. Laser engraving – high-quality engraving of stainless steel, acrylic glass, wood, fabric, and other materials. training in use of laser systems’ specific software. Designing – execution of individual orders.